I haven't posted in a while, so I thought I'd pose questions/thoughts to those who have had this problem, or are having it now. 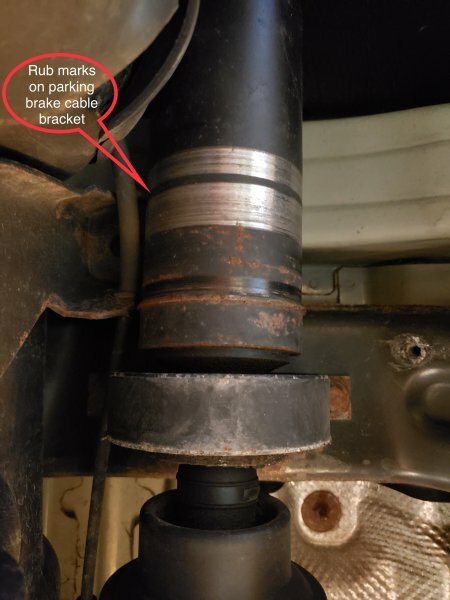 I have been driving with this rear propeller shaft center bearing surround failure for quite a while now, simply not accelerating hard to avoid the inevitable grating that happens when the axle shaft hits the parking brake flange (see pic). It's worse now, though, and now it doesn't matter how delicately I accelerate. I picked up a replacement center bearing assembly; it's a lot less expensive than buying an entirely new rear prop shaft, and, supposedly - if you do it right (marking the positions during disassembly, etc) - you avoid the commonly expressed concern about vibration post-fix. So here's my question: the design of this center bearing hard rubber surround seems insufficient: prone to croak. It's weak. 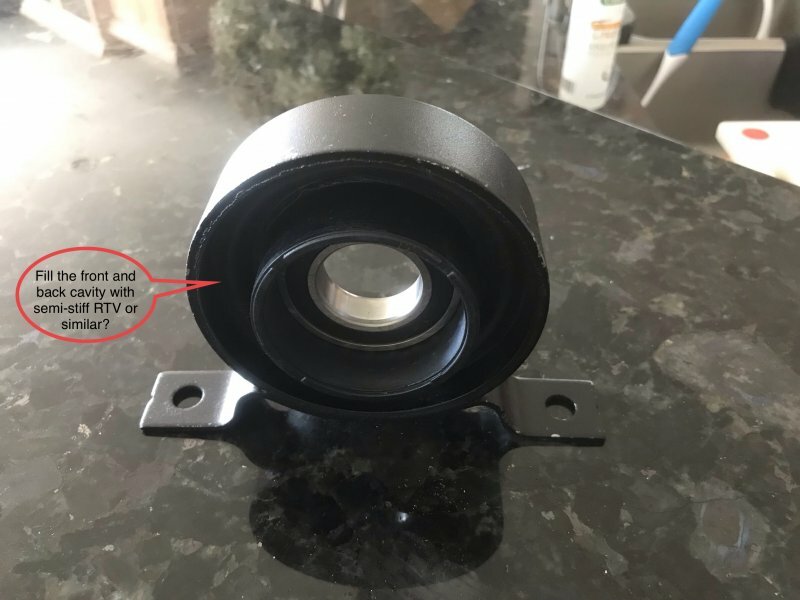 Has anyone replaced this center assembly and stiffened/protected the hard rubber bearing isolation donut by filling both sides of the cavity flush to the loop with a semi-hard RTV or similar, thus encapsulating that donut? 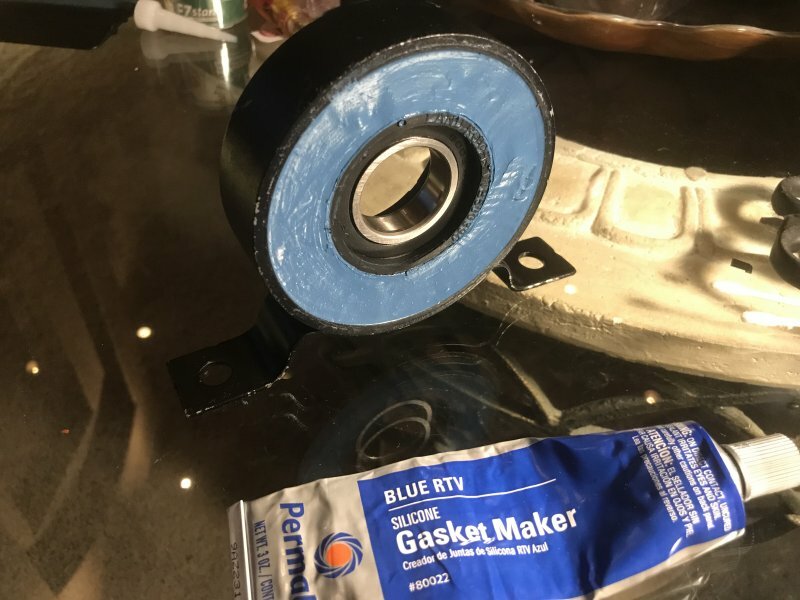 I would think doing so would serve two purposes: protect the main rubber bearing support, as well as providing it supplemental structural support, but without making it TOO stiff. Also: I noticed that the front u-joint appears to be leaking enough grease to sling onto the transmission tunnel and the muffler. 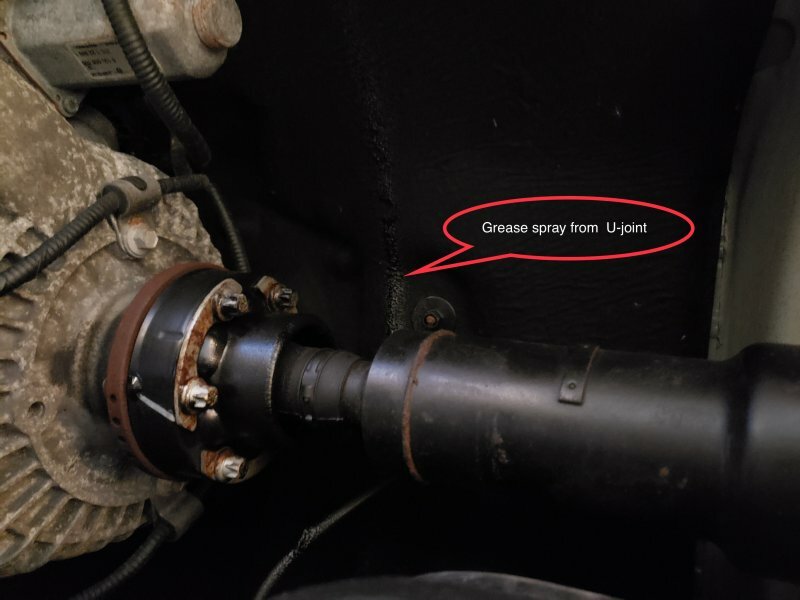 That can't be good either, and I'm wondering if some degree of grease escape is to be expected, or it's an indication that the front joint is on its way out. I'd be curious to hear anyone's thoughts on the subject! Custom '03 350Z Track PPW/Nav w/19" Nismo Z34s. I had exact same issues and just replaced the whole shaft. Much easier and peace of mind. Do a search on this issue and see some other people's responses. 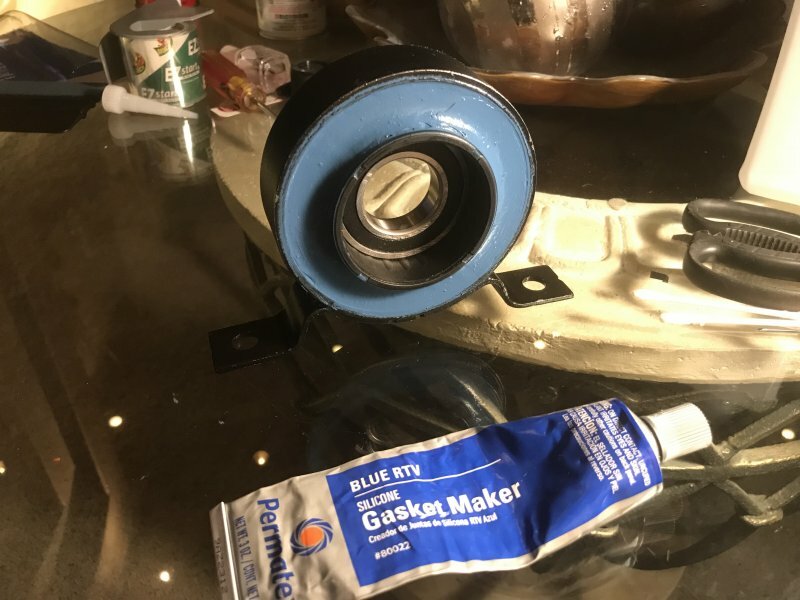 Yeah, I considered that, but the center bearing itself is so cheap by comparison that I had to give it a shot first - though that decision was made before I saw grease slinging out of the front u-joint boot (so I'll have to look at that carefully to figure out what's going on there). Front Transfer Output Bearing... Drive bearing out?